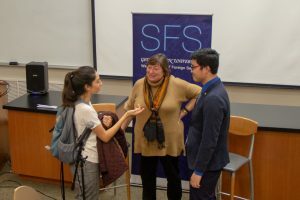 The Walsh School of Foreign Service hosted a conversation with SFS Centennial Fellow Catherine Novelli on environment and business in the 21st Century on October 29, 2018. Novelli previously served as the Under-Secretary of State for Economic Development, Energy and the Environment, and prior to that she worked at Apple, as the VP of Worldwide Government Affairs. 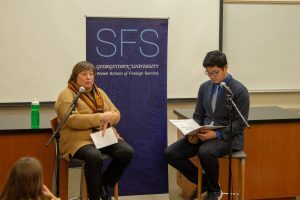 The discussion was moderated by Gary Xie (SFS’19), an SFS Centennial Junior Fellow working with Novelli. Novelli opened the discussion by expressing excitement regarding the number of people who have taken an interest in environmental concerns within the context of business, and stressed the importance of realizing that business and the environment don’t have to constitute an “either, or” decision. Effective business outcomes and sustainable environmental practices can go hand in hand, according to Novelli. She defined the most important aspect of any environmentally conscious business solution as market viability. Businesses need to capture the “hearts, minds, and,” most importantly, “pocketbooks of the consumers.” Novelli explained that this is because government subsidies and tax breaks can only take a business so far—for long-lasting results, legitimate cost savings have to be present for both consumers and businesses. Next, Novelli took questions from the audience. One student asked how small businesses—different in size and scale from the types of organizations Novelli has spent time at, such as Apple—could make a meaningful impact in the arena of sustainable business practices. To this, Novelli first clarified that no impact is too small and no effort is wasted when it comes to sustainability. Next, she laid out a number of ways businesses of any size could make a positive impact through the reduction of their carbon footprint. Her suggestions included collaborating with and supporting other environmentally conscious businesses, allowing people to telecommute, giving subsidies to employees using public transportation, and using video-conferencing instead of flying to meetings. In another student question from the audience, Novelli was asked if she had ever been in a situation where immediate economic interests and environmental sensibility diverged, and how she decided which course of action to take. Novelli replied with a story that, although she was not directly involved with, occurred during her time at Apple. Apple was looking to remove a harmful form of PVC plastics from their devices’ charging cords, and was told by the manufacturer they worked with that it would require a significant increase in the price of their services to manufacture the cords without PVC. Staying true to environmental sensibility, Apple agreed to the price hike in favor of the more sustainable product offering. Once the machinery was in place to produce PVC-free cords, all of the vendor’s other clients wanted to be able to advertise PVC-free products, and demand for the new manufacturing style shot up. With this surge in demand, economies of scale kicked in and the environmentally sustainable version of the product was no longer any more expensive to produce than its PVC-packed counterpart. In closing, Novelli stressed that the combination of creative thinking and a strong sensibility for the environment could lead to endless possibilities for improvements in business sustainability. She urged the audience to not take for granted the progress that has been made domestically—through initiatives such as the Clean Air and Water Acts—and to not let a creeping sense of complacency allow regression.